Come find tranquility at Marshside Cottage, a classic New England vacation retreat in Fairhaven, Massachusetts. Overlooking the salt water marsh and Buzzard's Bay, this vacation rental home exudes comfort and relaxation. The vacation cottage features two stories of living space, including three bedrooms which house one queen-size bed, two full-size beds, one twin-size bed, and one full-size futon. The living room sofa also pulls out into an additional bed. The sunny full kitchen features everything you need to prepare elaborate or simple meals, including oven, range, refrigerator, toaster, dishwasher, microwave, coffee maker, cooking utensils, and a lobster pot. The dining area seats six. 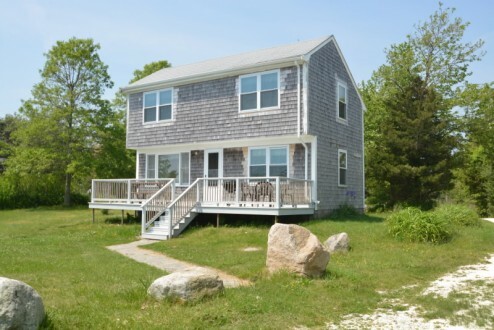 Whether you want to spend everyday on the beach and in the water or whether you prefer watch the action from the seclusion of the porch, you can have your perfect vacation at Marshside Cottage.